Caption: Left: High levels of the toxic ataxin-1 protein have destroyed nerve cells in the cerebellum of a mouse, causing a severe disease. Right: Here researchers have genetically blocked the genes that normally produce high levels of ataxin-1. This prevents the disease from developing and keeps the brain healthy. With our aging population, more people are developing neurodegenerative disorders like Alzheimer’s and Parkinson’s disease. We currently don’t know how to prevent or cure these conditions, and their increasing prevalence not only represents a tragedy for affected individuals and their families, but also a looming public health and economic crisis. Even though neurodegenerative diseases have varied roots—and affect distinct cell types in different brain regions—they do share something in common. In most of these disorders, we see some type of toxic protein accumulating in the brain. It’s as if the brain’s garbage disposal system is blocked, letting the waste pile up. In Huntington’s disease, huntingtin is the disease-causing protein. In spinocerebellar ataxia, it’s the ataxins. 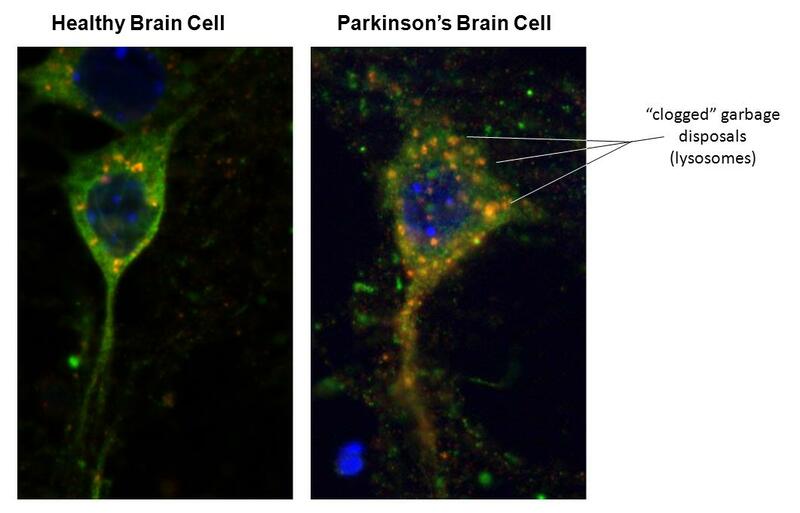 In Alzheimer’s, it’s beta-amyloid; in Parkinson’s, it’s α-synuclein. When garbage builds up in your kitchen, it’s a bad situation. When it’s in your brain, the consequences are deadly. Last week, a team of NIH-funded researchers based at the Baylor College of Medicine in Texas and at the University of Minnesota revealed a clever way to identify genes that normally increase the levels of these rogue disease-causing proteins.